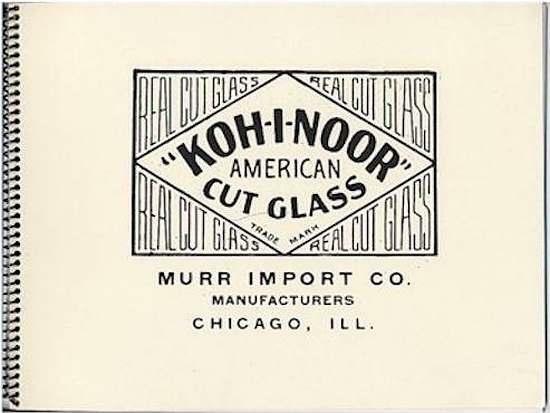 Although not a great deal is known about Richard Murr and the “Koh-I-Noor” company, it was felt that the information presented in this catalog would be of interest to collectors of American Brilliant cut glass. 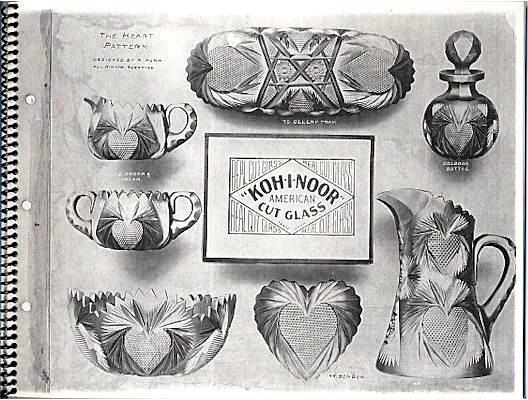 The “Koh-I-Noor” company was significant enough that it was mentioned by both J. Michael Pearson and Albert Christian Revi in their books on American Brilliant cut glass. The undated catalog was acquired by Martha Louise Swan a number of years ago; we reproduced the catalog in October of 1998 and offered it for sale in the ACGA’s “Hobstar.” When Mrs. Swan acquired the catalog, it had heavy cardboard covers which appeared to have come from an expensive photo album of the Stadler Photographing Compnay in Chicago. Someone had carefully cut the original “Koh-I-Noor” catalog apart and pasted the pages onto the linen pages of the photo album; the pages were then covered with a clear plastic-like coating to further protect them. The pages of the catalog/album have three holes in the left edge which Mrs. Swan said originally had eyelets and lacing which bound the pages together. Also pasted in the album were newspaper articles about President Woodrow Wilson; these have also been included in the reproduction catalog. We have a limited number of catalogs remaining for those of you who have started a reference library since we first offered the catalog. The catalog shows seventeen “Koh-I-Noor” designs.